Most people, including leading Democrats, are trying to sweep Rep. Alexandria Ocasio-Cortez's (D-NY) ambitious Green New Deal under the rug. That's because it's full of outrageous demands. Rep. Steve Scalise (R-LA) shared some of the more farfetched ones on his Twitter page. In 10 years. With taxpayers on the hook to pay. House Speaker Nancy Pelosi has little interest in prioritizing Ocasio-Cortez's proposed resolution. She couldn't even remember its name, calling it "the green dream or whatever." Sen. Mazie Hirono (D-HI) had similar sentiments for the environmental proposal, wondering how, in particular, the reduced air travel would work for her constituents. But, not all Democrats are running from Ocasio-Cortez's environmental idea. In fact, several of the already announced 2020 presidential contenders are singing its praises. 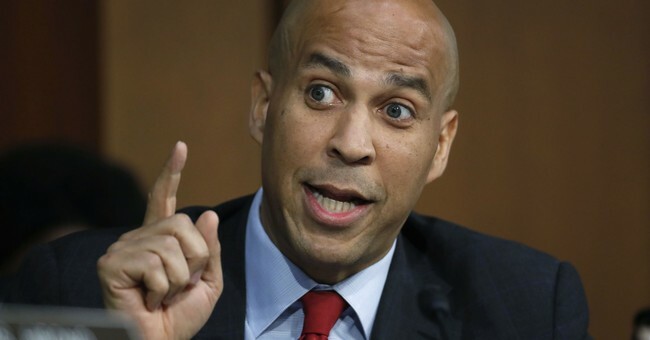 "Our planet is in peril and we need to be bold," Sen. Cory Booker (D-NJ) told a group of supporters Friday. He's not scared away by people calling it "impractical," because he's heard that before. "if we used to govern our dreams that way, we would've never gone to the moon," he reasoned. "God, that's impractical! You see that ball in the sky! That's impractical! We are a nation that has done impossible things before." He continued, asking, "Who came forward to save Earth from the scourge of Nazi and totalitarian regimes? Who came forward to save the continents from financial ruin? We came forward with the Marshall Plan." Yes, that is the senator from New Jersey comparing the Green New Deal to the moon landing and defeating Nazis. Some noted that this is all great news for the Trump 2020 campaign.